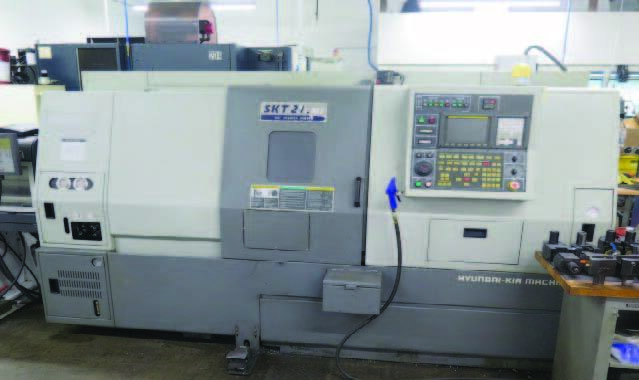 Hyundai-Kia SKT21LMS Twin Spindle Live Turret CNC Turning Center s/n SKT21LMS0280 w/ Fanuc Series 0i-TB Controls, Tool Presetter, 12-Station Live Turret, (3)Radial and (3)Axial Live Tooling, Full “C” Axis on Main Spindle, Full “B” Axis on Sub Spindle, 4000 RPM on Main Spindle, 6000 RPM on Sub Spindle, 4000 RPM Live Tooling, Parts Catcher, 10” Max Turning Dia., 20.8” Max Turning Length, 8” 3-Jaw Main Power Chuck, 5” 3-Jaw Sub Power Chuck, 3J Main Spindle Collet Nose, 5C Sub Spindle Collet Nose, Turbo Chip Conveyor, Coolant, LNS Quick Load Servo S3 Auto Bar Loader / Feeder s/n 302986. 1999 Haas SL-20 CNC Live Turret Machining Center s/n 62091 w/ Haas Controls, Tool Presetter, 10-Station Live Turret, (3)Radial and (3)Axial Live Tooling, 4000 RPM, 20Hp Vector Dual Drive, Rigid Tapping, Quick Code, 1mb Extended Memory, Delta/WYE, Spindle Orientation, Parts Catcher, Chip Auger, 8” 3-Jaw Power Chuck, 3J Collet Nose, 5C Collet Nose, Filtermist F275 Mist Control Unit, Haas Servo Bar 300 Automatic Bar Loader / Feeder s/n 90029. 1998 Haas VF-OE 4-Axis CNC Vertical Machining Center s/n 14402 w/ Haas Controls, 21-Station ATC, CAT-40 Taper Spindle, 7500 RPM, 20Hp Vector Drive, Brushless Servos, 1mb Extended Memory,Programmable Coolant Nozzle, Quick Code, Delta/WYE, Macro Code, Quick Code, Rigid Tapping, Chip Auger, 14” x 36” Table, Coolant. LeBlond Makino A55 PLUS 4-Axis 2-Pallet CNC Horizontal Machining Center s/n A94-496 w/ Makino Professional 3 Controls, 60-Station ATC, CAT-40 Taper Spindle, 12,000 RPM, 1 Degree 4th Axis Indexing Thru Pallets, (2) 15 ¾” x 15 ¾” Pallets, Toyo Chip Conveyor, High Flow Coolant System. Goodway GW-1640 16” x 40” Geared Head Gap Bed Lathe s/n 79324 w/ 33-2000 RPM, Inch/mm Threading, Tailstock, Steady and Follow Rests, TTC Tool Post, 8” 3-Jaw Chuck, Jacobs Flex Collet Speed Chuck, 5C Collet Closer, 14” Face Plate. Feeler Narrow Bed Second OP Lathe s/n 710601 w/ 230-3500 RPM, 5C Collet Closer, Cross Slide Assemble, 6-Station Turret, Coolant. HEM H90A-B/F 12” Automatic Hydraulic Horizontal Band Saw s/n 510296 w/ HEM Controls, Hydraulic Clamping and Feeds, Coolant. Walker Turner 16” Vertical Band Saw s/n 52BF1A w/ 18” x 18” Miter Table. Dayton 3Z327 Variable Speed Pedestal Drill Press w/ 300-4800 Dial RPM. Custom Electric/Hydraulic Sliding Ram H-Frame Press. Famco 3 ½ R Arbor Press w/ Speed Wheel, Stand. Lincoln Idealarc SP-250 CV-DC Arc Welding Power Source and Wire Feeder. Haas 4 th Axis 8” Rotary Head w/ 8” 3-Jaw Chuck and Mill Center. Haas 4 th Axis 5C Rotary Head. (2) Toolex 4-Position 6” Double-Lock Vise Tombstones w/ 15 ¾” x 15 3/5” Bases. Phase II 8” 3-Jaw Chuck Rotary Head w/ Mill Center. 7” x 18” Magnetic Chuck.